STEMpathy – Why Quality Professionals are More Important Now than Ever! “STEMpathy,” a term coined by academics and made popular by writers is the call to action for today’s educators to bring liberal arts into STEM curriculum. By merging STEM (science, technology, engineering and math) with empathy we will graduate people from schools who are able to build technology solutions with compassion and appreciation for the human experience. We can’t wait for students to graduate, we need empathy in software development today! Brand and customer interaction are digital before they are personal. Our experiences as employees, citizens, and participants are shaped by the digital requirements of registration, classification, and interaction. How can we make these digital experiences kind, intuitive, and welcoming? We must bring the human element to software development. who use the system wanting to find problems before customers do. mundane to automation so that we can pursue more complex and meaningful actions. We’ve punted the repetitive actions and small decisions to software enabled solutions. This is having tremendous impact on your lives – from working remotely to cutting through neighborhoods to avoid traffic on the 110. Reconnecting with friends of moments past on Facebook to building new global friendships sight unseen. This is having tremendous impact on businesses whose basic assumptions about preference and need no longer hold true. Assumptions is a very powerful word – when context changes dramatically, so do assumptions and the methods for validating the assumptions. Businesses that do not update their assumptions about preferences in the digital age are heading down a slippery slope. How big a deal is this? In 2017 we saw 21 major retailers declare bankruptcy. It was the Retail Apocalypse. This happened despite the fact that GDP had grown steadily over 18 months, gas prices were low, incomes were high and unemployment low. massive reduction in the number of bank branches – and the number of people visiting each branch has declined over 22% because people are interacting with robo bankers. Over the weekend, I was at a workshop and the instructor mentioned getting a Trip-Tik. One of the students, well into her 30’s said, “is that even a thing?” Thanks AAA but no thanks. We’ve got Google Maps, Waze, Yelp and iExit to plan our route and stops. This is an exciting and transformational time – the first major social change we’ve seen in decades is being fueled and enabled by technology – our current state is very different from five years ago. To support all these changes and improvements, there has been a mass effort around the world to increase the number of computer and software engineers being trained in our school systems – there has been extreme emphasis on STEM curriculum and STEM careers. People graduating with STEM degrees are commanding higher salaries and having more options available to them. We have government and industry leaders saying there are not enough tech skills to fill the growing need and we have recruiting partners citing the “war for talent” as they pluck talent from one company and move it to another. In the midst of this change and clamor for more technical skills, I think the answer lies in the creative, not the competitive. Fighting for talent and moving people from one place to another is the shell game. I believe we have everything we need right now to be successful. We have been scratching the surface of this problem in industry for years – with usability labs and UX design, we are acknowledging human factors matter – but we need to carry these practices all the way through software development. Educators are tackling this problem. In 2015, at a summit of educators Research Triangle Park, Brett Brenton, who is with Research Triangle Park in charge of strategic partners, used the term STEMpathy in his talk. It is the first time I have been able to find that term. He introduced the notion to educators that while the STEM skills are great – we need to include liberal arts in order to fuel innovation. Thomas Friedman, the NY Times writer and author of “Thank you for being late,” uses the term frequently. He is an advocate for bringing compassion and humanity to our systems by not just training engineers, but by building well-rounded people with technical skills. STEMpathy is simply merging the notion that human beings interact with technology and that simplicity and elegance of design will lead to higher function/value. Higher function and value support digital transformation. Our educational institutions are answering this call to action. I have two friends who have received PhDs in Human/Computer Interface and Human Factors in the past few years. More and more universities are enriching curriculum and educating new potential leaders. What happens when you don’t approach software with the user and the life experience you want your users to have – you spend money and waste resources building things customers don’t care about. You alienate customers with a poor user experience. You face a digital apocalypse. You know, we’ll pay a premium for better service – just look at how many people use Audible and not the library. The overdrive app used by most libraries was years behind audible in making listening to books easy and accessible. By the time it came close, so many people were so used to their Audible subscriptions, that they stopped using the library function. What can organizations do today to bring STEMpathy to their software development teams? 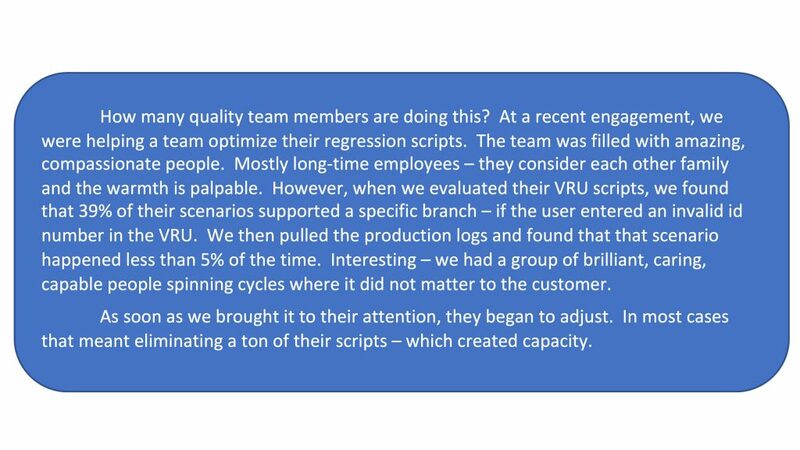 Organizations who accelerate test automation create capacity on their quality teams – capacity that is filled with empathy for the user. These team members are available and ready to expand their skills to help their organizations become more digitally savvy. I have discussed this opportunity with friends in the quality domain and have met with mixed reaction. Some embrace the idea of growing in relevance – others say that the art of testing will be lost. The art of testing must evolve – taking advantage of automation technology. Did you know that Plato wrote that his teacher/mentor Socrates was worried that about ability to memorize would decrease because of the written word? Over the generations all changes have affected the way we work and learn – writing, the printing press, and the Internet – it is what we do with this capacity that matters. Automation is not a dirty word, it is happening – the mundane is getting automated. Regression scripts need Combinatorial Test Design (CTD) and automation. When quality teams do this, they create capacity for one of the greatest sources of talent, insight, and compassion within an organization, they are creating capacity with Quality professionals. The quality profession is a special brand of people who straddle the line between technology, business, and the customer. Our organizations are filled with people who know our products, our customers, our culture, and systems – and if given the opportunity are more than capable of bringing STEMpathy to the workplace today. Today, I propose the STEMpathy cycle – a self-referencing, reinforcing cycle that brings compassion to software design and experience. At the same time, we’re creating capacity, the need has never been higher – we don’t have five years to wait for students to matriculate, graduate, learn our products, and bring STEMpathy – if we want to prevent the next apocalypse of industry, we need to unleash the power of the Quality team. 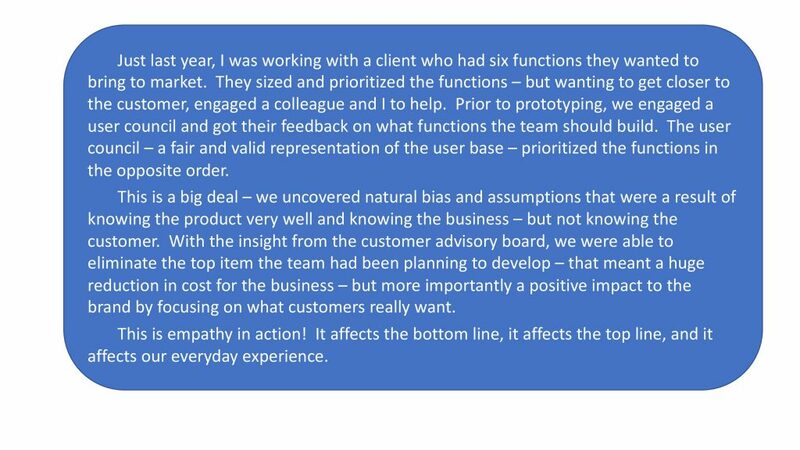 It doesn’t matter where you start – since it is a cycle – just jump in and begin feeling the bottom-line benefits of compassion in your software experience today. PRODUCTS – What do customers think about your products? How are their opinions changing and how is that feedback and insight getting to your software teams? I am watching too many clients build silos around product. Product knows what the business wants and sends it over to Dev. Dev is then optimizing the way to build the most features with the most bang for the buck. 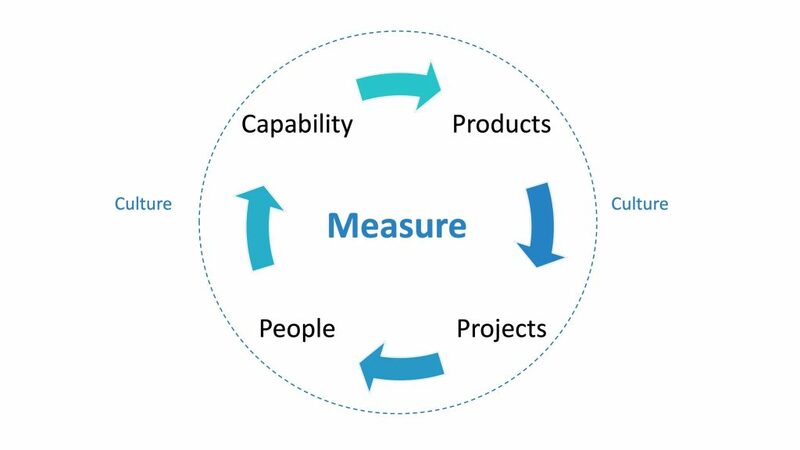 This is a new form of waterfall – it is linear, serial, dependent, and doesn’t include the customer. To fix this, we must actively measure, monitor, and manage the usability of products. That’s it. Actively measure, monitor, and manage the usability and use of products. You don’t need a re-org to start measuring customer happiness and use of systems. You just need to tap into the resources and data that exist today. The opportunity and challenge is to find those resources. Look at logs, grab surveys, study the market, build relationships with other teams. PROJECTS – This is my favorite part of the cycle because I think everything in life is a project. Sometimes I make these projects harder than they need to be, but since I think of life as a project, there is a beginning a purpose and an end. When we build software, we need to focus on what the client wants – not what we want because we know the product and the service. We need to focus on what will serve the customer and grow the business, not check off the most features per story. I know the game – I was a developer and a PM. If I could solve something once and apply to multiple scenarios – I was being efficient and driving value. Sounds good, right? Wrong. Was I building what the customer wanted? I’ll date myself – in 1990, I was coding a custom uniform rental management system. I realized that in ten years, all the applications were going to have to account for the year 2000. So I built a date module and integrated it into everyone’s programs so the whole system was Y2K compliant. But, this gold-plating had me running a couple weeks late with delivery. My boss, a former green beret comes over to me as I was finishing this up and says, “Coyle, what the bleep are you doing?” I smile and look up, “I’m coding for year 2000, Bob.” He says, “Your code will be obsolete by then, knock it off.” By the way, the code generator we were using had a native Y2K function. I had lost two weeks doing what mattered to me, and not making sure it mattered to the customer. we can from our perspective – but the best can from the customer perspective is what matters to the top and bottom line. If you are in Quality, ask yourself, how do you prioritize your scripts? Are they based on business probability? Are you constantly checking user patterns and preferences and making sure that your validation and verification techniques mirror the customer expectations? Are you making sure the functions you’re being asked to develop tests are being prioritized by user councils? At every step of software development, check in the with the customer ask and customer preferences. Just because you can, does not mean you should. Check in with customers and their preferences. PEOPLE – the most important component of any system are the people in the system. If we’re trying to build empathy towards our customers, it starts with rekindling the flame of empathy that exists in each one of us – that flame of empathy that brought us to quality in the first place. We’ve turned it off – we’ve turned off our compassion valve because we’re trying to survive in a system where compassion is not rewarded. People who work in quality are often passionate and told to be less emotional – and over time, we become less emotional. It is fine to be less emotional, but it is not fine to stray from the customer! You get the behaviors you measure and reward, so why not measure an reward behaviors of empathy? Spend time sitting with customer service agents, participate in a UX lab experiment, try a job rotation where you support another team. Leverage the VOC survey results and review the NPS. Read the Foresee data and comb through call log summaries. There are mounds of data about the customer experience, you just need to harvest it. BE A CUSTOMER of your own company. Try your products and services. Experience them as a customer. I worked for an organization where we discovered that fewer than 20% of the employees were customers – that’s not good. If you’re not a customer, you don’t know what a customer wants. You’ve got to rekindle your own passion for the customer. If you’re a manager, create an environment that encourages the team to build that compassion. If you’re not a manager, find the resolve within yourself — show the value of the process and help institutionalize. If your team is not connected to the other teams that are collecting data – be the bridge. No one says no to a cup of coffee. CAPABILITY – These are the operational tools and techniques necessary to encourage empathy. The current and growing method many organizations are using is called Design Thinking. First time I went through training, I said, “C’mon, this is what we’ve been doing all along.” Then I realized I had been part of a system that slowly pulled all the value out of end-customer focus by prioritizing speed and efficiency. Design thinking is deliberate and systematic approach of putting users first. There are specific techniques and methods – but the notion is Covey-esque. Begin with the end in mind. Invite your users to tell you what they want either directly or indirectly. Then – listen. Capability includes tools and measures in addition to methods. Do you have the forum to run a customer council? Do you have access to a usability lab? Do you have prototyping tools? Can you enhance your existing system logs to get more insight? Do you have access to Gartner or Forrester for industry trends and standards? Don’t just talk about capability – set targets to elevate your capability, define what elevated capability looks like. Make it visible and real so that people know they are welcome to bring ideas and passion to the workplace without fear of scoff or retribution. Over time, this cycle of four begins to influence and strengthen the culture. Educators are calling for building STEMpathy into curriculum. Great. It is happening. However, we need it today because businesses are changing overnight. STEMpathy means building our applications for the best possible experience end to end. The call to action is for us to harness the power within ourselves and our teams by following and fueling the STEMpathy cycle. The STEMpathy cycle is a model to increase the empathy within your organization. 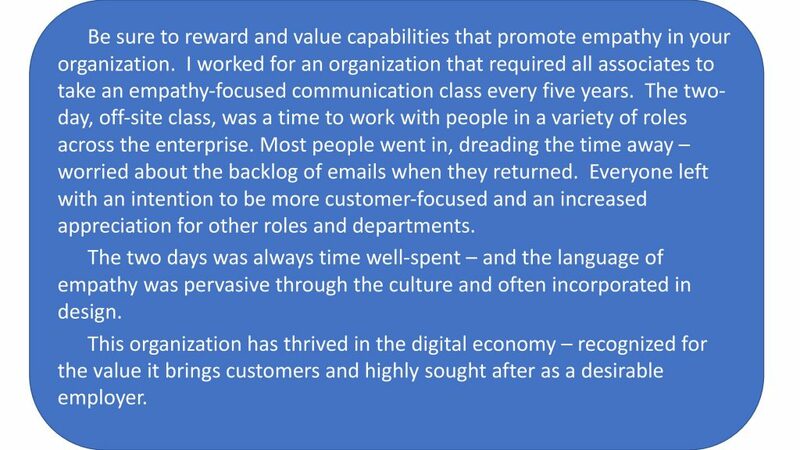 We have seen tremendous results, working within corporate cultures (and their chosen technology stacks) by deliberately enabling empathy. We have used facts and data to support feelings and intuition – which is a powerful technique of showing the business value of change. What is Risky About a Workforce?